People all across India, Pakistan, and Nepal were jolted awake this morning as a 7.9 magnitude earthquake struck the state of Gujerat in India, killing at least 1,789 people and toppling hundreds of buildings. According to a CNN report, while most of the damage occurred in town of Ahmedabad, the epicenter was located near the town of Bhuj, some 249 miles (400 kilometers) away. This image, acquired by the high resolution Advanced Spaceborne Thermal Emission and Reflection Radiometer (ASTER) flying aboard the Terra spacecraft, shows an area west of the quake’s epicenter (23.4° N, 70.32°E) and north of the city of Bhuj. 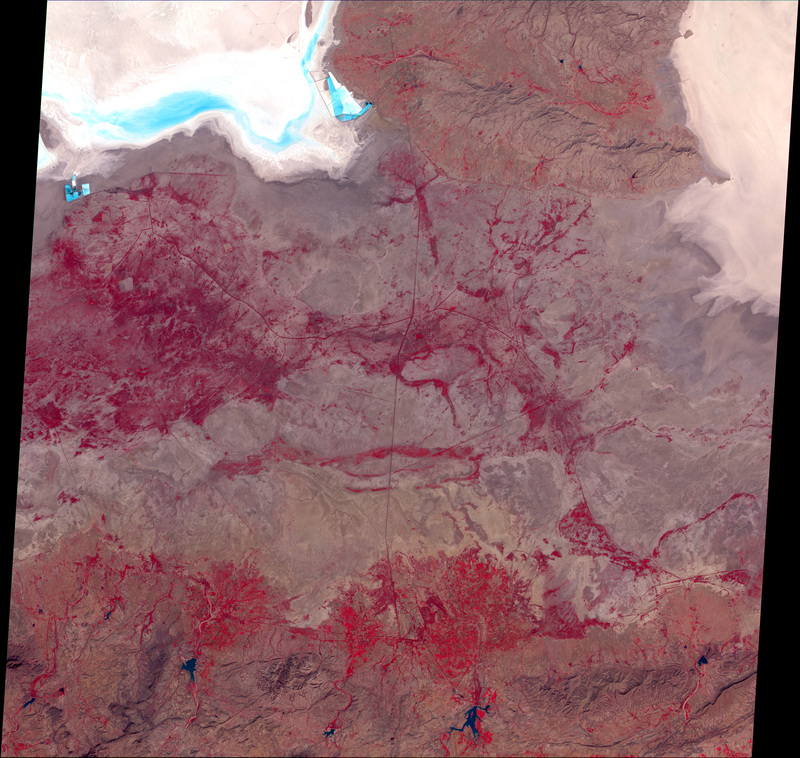 In this false-color image (combining near-infrared, red, and green data) vegetation appears red, bare ground is brown, salt flats (the Rann of Kutch) are beige, and reservoirs are dark blue. 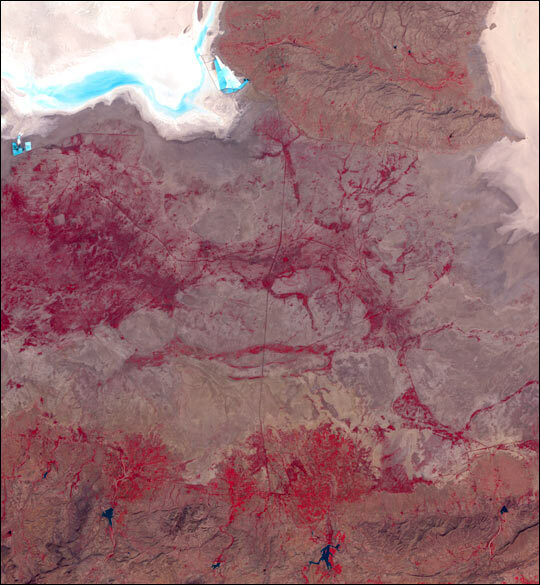 The light blue areas at the top of the image are likely shallow pools of standing water. The bright red patches are irrigated fields, mostly clustered on the alluvial fans of rivers and streams running out of the hills to the south. Today's quake was estimated to be larger than the one that killed 18,000 people in Turkey two years ago and about the same intensity as the great San Francisco earthquake that rocked California in 1906. Though an earthquake of this magnitude hasn’t occurred in this region of India in fifty years, northern India and Pakistan are rife with tectonic activity. For as long as people have walked this earth, the Indian subcontinent has been pushing into Asia. The clash of the two landmasses has given rise to the Himalayas as well as several major faults that run through the sub-continent of India.